Looking for the right outfit to fit your New Year’s Eve plans? 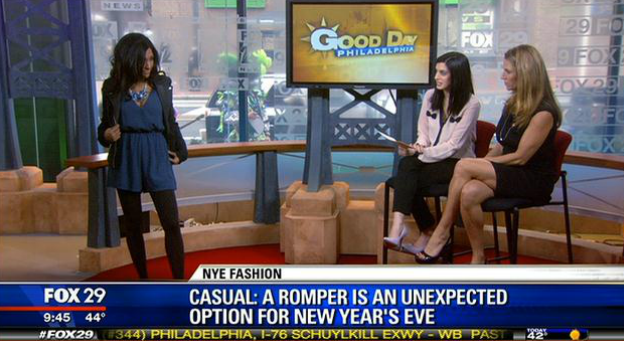 Myself and four lovely ladies visited Fox29’s Good Day Philadelphia to show you affordable fashions to fit your New Year’s Eve plans. Romper by Ya Los Angeles, $48 at Nich Boutique. Statement Necklace by Jack E Oh Accessories, $28 at Nich Boutique. I ‘Heart Ronson’ Jacket, Was $72, Now $35.99 at JCPenney. 9 & Co. Heels, Was $40, Now 27.99 at JCPenney. Wow Couture sweater dress, $65 at Smak Parlour. Worthington boots, Was $49, now $33.99 at JCPenney. Earrings, $26 at Smak Parlour. Ark & Co dress, $61 at Jax Boutique. Call It Spring purse, $30 at JCPenney. Christian Siriano for Payless, Was $36.99, Now $24.99 at Payless. Earrings, Was $8.99, Now $3.99 at Payless. Chaps gown, Was $120, Now $69.99 at Kohl’s. Shawl, Was $28.00, Now $14.00 at Kohl’s. Dana Buchman Pump, Was $69.99, Now $39.99 at Kohl’s. Apt 9 Bangles, $15.60 at Kohl’s. Want to get styled by me for FREE? You can now by booking a personal shopping session at King of Prussia Mall.